Schindler was founded in 1874 in Lucerne, Switzerland, and is one of the world’s leading providers of elevators and escalators as well as maintenance and modernisation services. The Group has over 1000 branch offices in more than 100 countries, as well as production sites and research and development facilities in the US, Brazil, Europe, China, and India. Задача: With over 100 years of providing elevators to more than 100 countries worldwide, Schindler discovered a gap in the market with the idea to use the unused space on elevator doors as a unique advertising space. 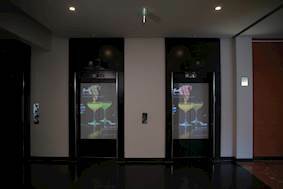 Решение: Schindler partnered with Optoma to create the Schindler “Ahead DoorShow” – an out-of-home advertising medium using static or moving pictures projected onto elevator doors. Optoma’s ultra short throw ZH400UST laser projector was selected as the best solution. 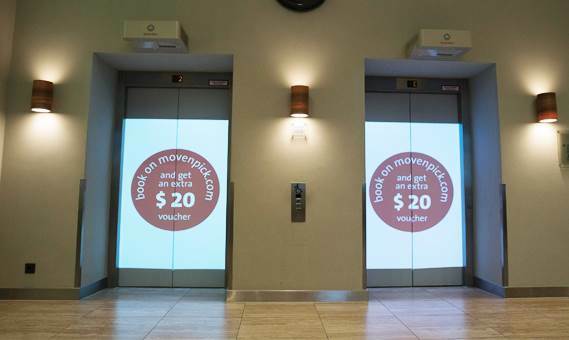 Результаты: The Schindler Ahead DoorShow successfully captures the interest of anyone waiting for an elevator so companies, hotels and shopping malls can now market their elevator doors as an advertising platform. With over 100 years of providing elevators to more than 100 countries worldwide, Schindler discovered a gap in the market with the idea to use the unused space on elevator doors as a unique advertising space. The biggest challenge was finding a projector with the specifications that fit the criteria required to create eye-catching, bright and colorful content with 24/7 operation. It was also imperative the projector was reliable and needed minimal maintenance. 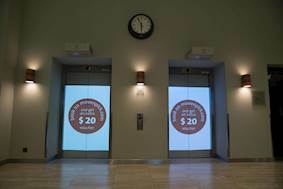 Schindler partnered with Optoma to create the Schindler “Ahead DoorShow” – an out-of-home advertising medium using static or moving pictures projected onto elevator doors. Optoma’s ultra short throw ZH400UST projector was selected due to its high brightness 4000 lumens, Full HD resolution and laser light source for up to 20,000 hours of virtually zero maintenance operation. In addition, the ZH400UST can project large images from just 25cm away from any surface. And the advanced features and networking capabilities allow remote access, as well as being able to control and monitor content and timings via Schindler’s native software. The Ahead DoorShow is designed to promote marketing and advertising collateral within the leisure and hospitality segment, specifically hotels, airports, shopping malls and exhibition centres. The ZH400UST offers complete flexibility through the management system whereby each projector can be reached individually via a central server. 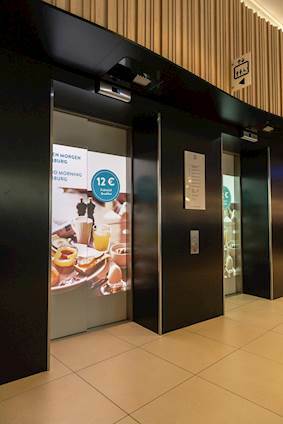 The Schindler Ahead DoorShow successfully captures the interest of anyone waiting for an elevator so companies, hotels and shopping malls can now market their elevator doors as an advertising platform.